Care for some spicy spaghetti? Go Kung Pao!!! I'm not going to pretend this is something new. 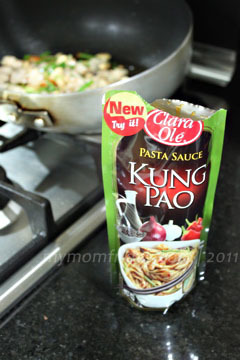 Kung Pao (which translates to palace guardian/official) is a famous spicy Asian sauce and is definitely one my favorite pasta sauces ever since I had a taste of California Pizza Kitchen's Kung Pao Spaghetti, with shrimps, more than 10 years ago. Then came the equally delicious Charlie Chan Pasta from Yellow Cab, a popular local pizza chain. What I love about kung pao sauce is it's very distinct Szechuan-style sweet-hot-salty flavor with red chilies, complemented with roasted peanuts and colorful mix of veggies for my pasta. And now I discovered this ready-to-use pasta sauce at one of my weekly trips to the supermarket -- Clara Olé! Simply toss with your favorite pasta noodles, meat, shrimps or tofu and you're ready to go! Cook spaghetti as instructed on the pack. Heat a pan with the oil, then saute and lightly toast minced garlic. Add in chicken cubes and stir-fry for around 15 minutes until browned. Mix in the bell pepper, celery, spring onions, and peanuts. Continue to stir-fry until chicken is done. Pour in the kung pao sauce and mix well. Add ground pepper. Taste and add chili flakes and chili oil if you prefer more heat. 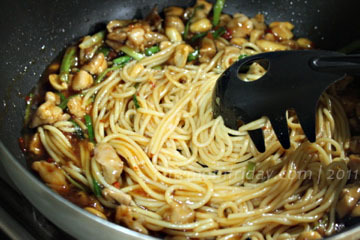 Gradually toss in cooked spaghetti until well coated. 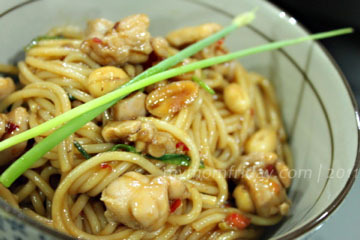 Serve and garnish with more spring onions and peanuts if desired. What I like about this instant kung pao sauce is it's rich, balanced flavor, yet it's not too hot, which was just perfect for me. This way, you can easily control the heat to your liking by adding more chilies or chili oil. You can actually see bits of chillies and taste a subtle nutty taste to the sauce. Next time, instead of chicken, I'll use juicy, succulent shrimps! 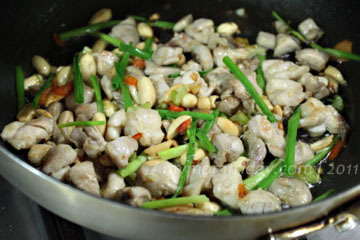 Wikipedia: Westernized versions, usually called "Kung Pao chicken", commonly consist of diced marinated chicken stir-fried with skinless unsalted roasted peanuts, chopped, sliced, or diced red bell peppers (as well as other vegetables such as green bell peppers, celery, Chinese cabbage, water chestnuts, and carrots), sherry or rice wine, hoisin sauce, oyster sauce, and chili peppers. 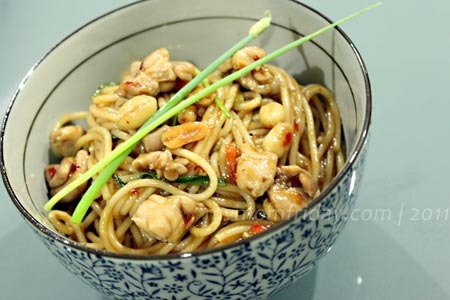 Although chicken is traditionally used, seafood items such as shrimp or scallops, or other meats such as beef or pork, are sometimes used in place of the chicken (although typically only a single meat or seafood is used).